Yes, I know Beretta doesn’t make one, but this was something that I thought might interest a lot of readers. Recently a local shop posted on CalGuns that they would be offering a class on how to build an AR and you get to take home the rifle you built. 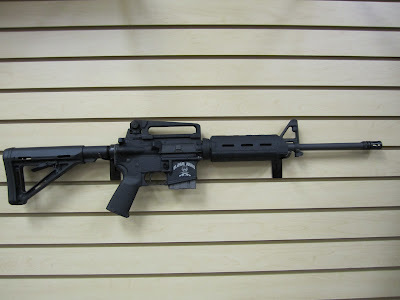 The price was very reasonable so I headed up to Global Arms in Glendale to fill out the registration on the receiver so my 10 days would be up and I would be able to take it home on the day of the build. I have done some minor gunsmithing in the past and I’ve been looking at getting an AR for a while so I thought this would be a great way to be introduced to the rifle. 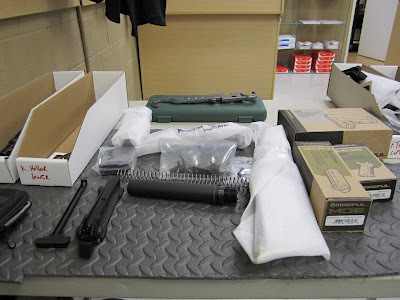 When I got there the day of the class my parts were in two boxes along with the tools I would need all laid out ready for me to go. My rifle differed a bit from their standard kit because I wanted the Magpul furniture so I upgraded to that. At the time of this writing I have unfortunately not been able to shoot it but will soon. I was very happy with the class because it was very informative and Dirk didn’t mind answering our questions or going over something again when we didn’t get it the first time. I also feel pretty confident that if something goes wrong with the rifle or I want to upgrade it I will be able to fix or replace the part. I do hope that I get to do something like this again either here or at another shop. So have any of you done or wanted to do a build like this before? Any thoughts or questions?